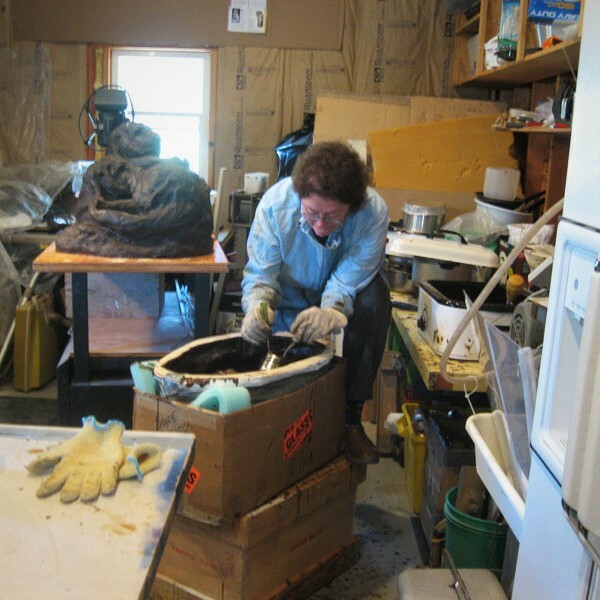 Kathleen makes glass sculptures using a variety of techniques, including fused, slumped, and kiln cast glass. Her work features detail-rich glassware full of seasonal colors and exquisite wildlife that inspire creativity daily. Truly Wild Plates made with kiln fired glass from frit. Concrete sculpture by Barbara Liss. The face is actually a portrait of Kathleen, featuring brown eyes, hair, cosmetic dentures, and accompanied jewelry including a glass sea turtle hatchling sculpture by Kathleen herself. To view more detailed information on Turtle Lady, like pricing, click here. 100% of this sculpture's proceeds are donated to Cycle of Life Sea Turtle Project. To begin with a wildlife subject, I take photographs, research the animal, transfer the images into a drawing, and using glass as my medium, I give the animal a soul and life, even as it is in its inanimate art form. I hope the art will speak to the viewer, tell a story, and invite the viewer to reach out and touch the art, and in the process become curious to know more. My process of multiple layers of compatible glass called frit, which is fired multiple times to create realistic wildlife portraiture, is a time consuming procedure. I can only achieve the detail and the photo realism by learning new ways to work the glass every time I start a new art piece. I do commissions, but I am particularly interested in my own work in threatened and endangered species and kiln cast sculpture. My creative process is continually evolving, and to say I build my work upside down and backwards means I am solving a unique puzzle daily. In the studio I am surrounded by projects. I am working on a multiple year commission depicting a specific coral reef north of Kailua-Kona, Hawaii. The 25.5 square feet of kiln formed glass, involving five panels will have over sixty marine wildlife creatures and multiple types of coral. I continue to work on a Black Labrador fine art wall piece and cast glass hatchlings representing the seven species of sea turtles. These are part of my sea turtle sculpture called “The Cycle of Life: Sea Turtle Glass Sculpture – Environmental Art Education Project”. When possible I volunteer for the Alligator Point Sea Turtle Patrol in Alligator Point, Florida. In January 2015, I volunteered briefly for the Hawaiian Wildlife Fund in Maui. I look forward to more in depth studies on all the species of sea turtles in different areas around the world. Scuba diving is a relatively new exciting adventure in my life, and the magic of colors and diversity of forms below the surface of the ocean is one of God’s most fantastic paintings. A kiln cast and hand blown geo vessel from Kathleen's Spiritual Reliquaries series.